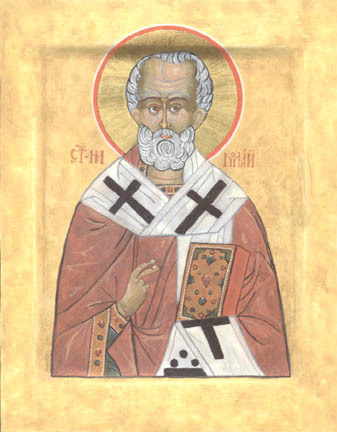 St. Nicolas was elected Archbishop of Myra in Asia Minor in the 4th century. His pastoral care and great goodness endeared him to his people. His works of charity deeply endeared him in the hearts of all people who felt themselves downtrodden and oppressed. Miracles attributed to St. Nicholas include the calming of the sea by prayer which saved a ship of pilgrims to the Holy Land, the healing of many with incurable deseases, and his fatherly interention which saed three destitue maidens from being forced into a life of sin. In the present day, he is remembered as a patron saint of gift giving on December 6th. He is the patron saint of the Russian people. His icon is possibly the most popular in Russia. 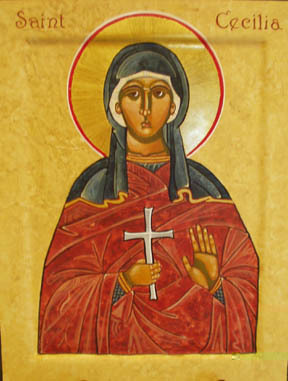 Click link to Anonymous Russian Icon of XIII or VIV Century of St. Nicolas.